MaTéléFree cannot run without the presence of VLC (version 2 or later). VLC can be downloaded directly from VideoLAN's web site. Its type, 32 or 64-bit, must be the same as MaTéléFree's one. No installation needed, unzip and run. The channels and radios logos are NOT present in MaTéléFree's "zip". They can be downloaded separately. 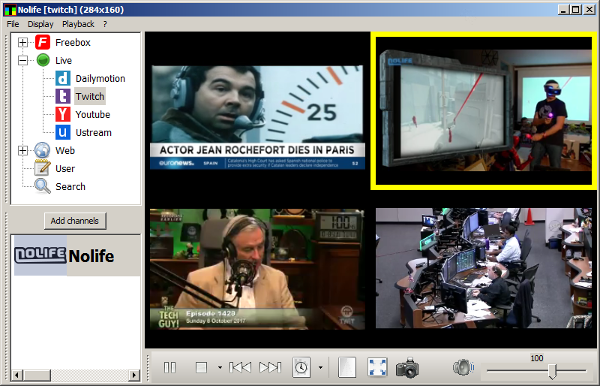 MaTéléFree enables you to access a list of known multimedia (video and radio) streams. Some are read from the Freebox and others directly from internet servers. If you don't know what a Freebox is, please consult its Wikipedia's page. It is not because you have a Freebox that you have access to its multiposte service. Consult Free site for more information. Access to all channels and radios offered by the multiposte service : "en option" or not. All channels available on Freebox TV may not be so in multiposte. Search for "en option" channels that can be currently watched. Some can be accessible be during certain periods of the day and some can be temporarily offered. The processor and the bandwidth have to be up to the task.